It's official: Westworld is near the top of the popularity charts, according to IMDb. In the first week after the pilot, 1.84 million people tuned in to watch people dressed like cowboys kill robots dressed like cowboys, and then loved it so much that they kept on watching. That's great news for HBO, considering the first season alone cost $100 million to produce. Westworld's creator Jonathan Nolan hasn't been shy about using video games to both research and influence his show. The in-show world of Westworld resembles an open sandbox game like Grand Theft Auto and Red Dead Redemption, both of which Nolan admitted to playing as "research" with his wife, Lisa Joy, who co-created Westworld. Another influence came from the Bioshock series, which Nolan called "among the most literate and thoughtful pieces of entertainment" he'd seen in years. In particular, Nolan was blown away by the intricate backstories of all the nonplayable characters. He found it amazing that so much attention and detail was given to these trivial characters, most of whom are just shot down by players without a second thought as they blow through a room. That's basically the premise of Westworld — nonhuman characters that the "real" players can talk to, take to bed, or kill on a whim. 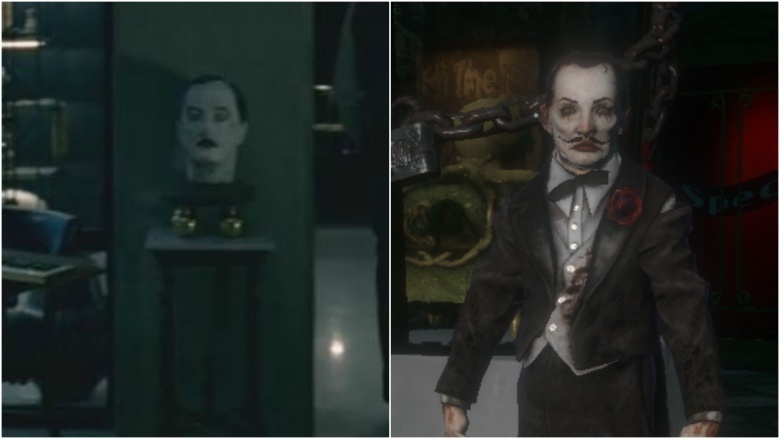 That's probably why somebody stuck the head of Sander Cohen, a prominent resident of Bioshock's city of Rapture, in Episode 3 of Westworld. Check out the comparisons above — give it a mustache and it's clearly the same face. It makes you wonder if any of the other decommissioned hosts will be a platform for more Easter eggs in the future. After the first few episodes, a lot of people started comparing Westworld to Alice in Wonderland. Not necessarily because they have the same plot, but because they both deal with a hidden fantasy world where nothing is quite what it seems. To get there, you have to go "down the rabbit hole." To be fair, a ton of movies and shows do it. It's the perfect throwaway line to tell the audience, "Hold on to your knickers, because things are about to get topsy turvy." And Westworld's writers couldn't help but fall into the same hole, so to speak. 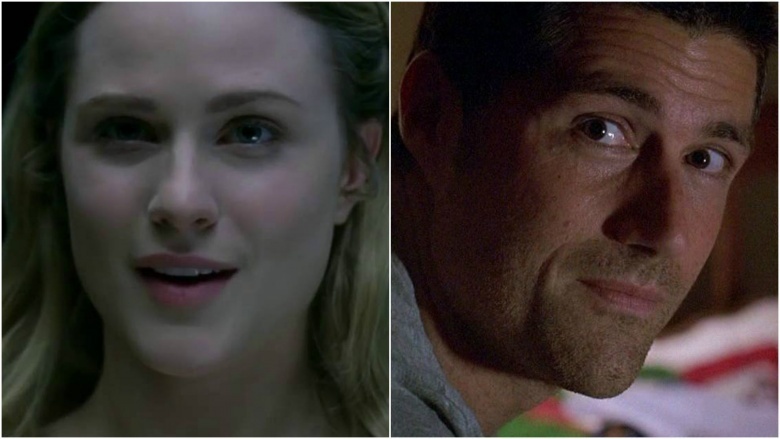 We've had Bernard Lowe (Jeffrey Wright) asking Dolores Abernathy (Evan Rachel Wood) to read passages from Alice's Adventures in Wonderland (which is also cool for a different reason), but there's one Alice Easter egg that's been staring everybody in the face the whole time, and nobody's noticed: Dolores looks almost exactly like Alice. She even wears practically the same dress. Coincidence? Considering the incredible amount of detail that's gone into Westworld and its script, we don't think so. It probably doesn't mean anything in the show, but Dolores' wardrobe choice definitely feels like a visual promise that Dolores' world is about to get blasted into Wonderland. One of the running references in Westworld has been the theory of the bicameral mind, a philosophy that originated in the 1976 book The Origin of Consciousness in the Breakdown of the Bicameral Mind by Julian Jaynes. Basically, the theory says (and we've heard this often in the show) that our thoughts were interpreted by early man as the voice of God, a belief that gave rise to modern consciousness. In Westworld, Ford mentions that Arnold programmed a type of bicameral mind into the early hosts to push them toward consciousness. Although the bicameral mind is mentioned specifically in Episode 3: "The Stray," the series then kind of lets the idea float away. Or does it? As mentioned in the video above, the series kept dropping Easter eggs about the bicameral mind, but we were just too caught up in everything else to notice. For example, In Episode 4, Ford mentions that the first hosts thought the programmers were gods. In Episode 2, Lee Sizemore unveils his new storyline "Odyssey on Red River," a name that harks back to Julian Jaynes' theory that the characters in Homer's Iliad and Odyssey were displaying symptoms of the bicameral mind (going to war because the "gods" told them to, etc.). Wild? You bet. 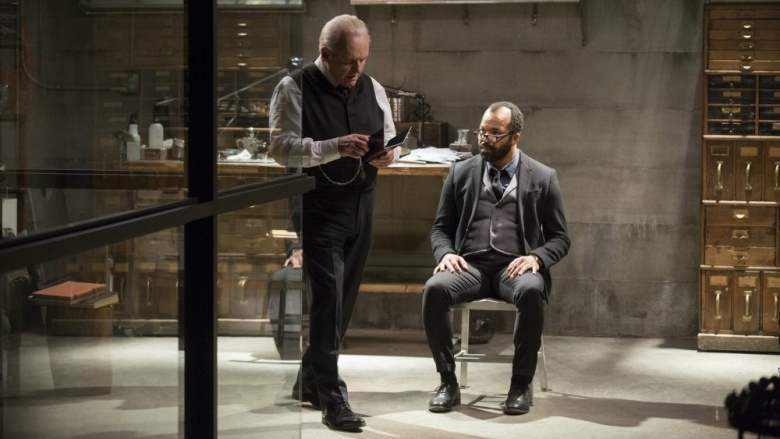 But even Marcel Kuijsten, the director of the Julian Jaynes Institute, has weighed in and said that Westworld's entire storyline so far goes hand-in-hand with Jaynes' original theories. It definitely gives you a lot to think about. Check out the fantastic video above for a deeper look into this long-running Easter egg. What, another Alice Easter egg? Nope, this one's a little geekier even than that. The connection was spotted by Reddit user red_widow in Episode 3: The Stray. As the episode opens, Bernard gives Dolores a copy of Alice's Adventures in Wonderland during one of their mysterious chat sessions. He points out a particular passage for Dolores to read. The passage is: "How queer everything is today! And yesterday things went on just as usual. I wonder if I've been changed in the night? Let me think: Was I the same as when I got up this morning? I almost think I can remember feeling a little different. But if I'm not the same, the next question is, who in the world am I?" While the quote resonates with Dolores' sense that she's changing into something else, it also appears to be a throwback to another flagship production by executive producer J.J. Abrams: Lost. In Episode 10 of Season 4, Jack reads the same passage to Claire's son, Aaron, as a bedtime story. Leave it to Abrams to drop a Lost Easter egg in the middle of a completely different show. Despite being set in both the future and a simulation of the past, Westworld likes to drop modern-day songs into its episodes. If you haven't noticed them, that's because they've been disguised as old-timey jingles (and one epic orchestra rendition). They show up mostly as the songs belted out by the player piano in the Mariposa Saloon. The first anachronistic song we heard from the player piano was Soundgarden's "Black Hole Sun" in Episode 1. In Episode 2, it plunked out Radiohead's "No Surprises," and then "The Forest" by The Cure filled in the fourth episode. There are a couple reasons for these odd Easter eggs, according to showrunner Jonathan Nolan. First, they're designed to pull you out of the story line in the chance that you recognize one of the songs. It sounds counterintuitive because most shows do all they can to keep you immersed in the action, but Nolan explained that that's the whole point. He's reminding us that we're not really in the Old West and that in spite of the thrills in the park, we're really in the future, where these songs would actually exist. And then there's the odd style choice of using The Rolling Stones' "Paint it Black" during the saloon robbery in the climax of Episode 1. While Nolan had no specific answers about that one, it probably follows the same logic, namely, reminding us that this absorbing scene is all scripted. We're just watching a show within a show. It was bound to happen sooner or later. Since Westworld is a remake (in spirit) of a Michael Crichton story, it was inevitable that someone was going to stick in a reference to Jurassic Park. Well, they finally did, and it was easy to miss. In Episode 5: "Contrapasso," we're given more time to watch Felix and Sylvester, the two "butchers" who first let Maeve escape and run naked through the lower levels of HQ with a scalpel. Felix is clearly overstepping his authority as a low-level employee by taking a stab at programming some of his own code into one of the hosts. His subject is a little sparrow, which he smuggled into his glass-walled exam room to practice on during his lunch breaks. While the bird tries to integrate Felix's imperfect programming (and doesn't quite manage it), Felix leans down to the table to coax the bird along, saying, "Come on, little one" in encouraging tones. Sound familiar? That's exactly what John Hammond said to the hatching velociraptor in Jurassic Park. Even the setup is similar — a scientist in a futuristic theme park watching the fruits of his labors struggle to life and getting so emotionally invested in it that he can't help but lean in close and encourage it as if it's a child. In Episode 6: "The Adversary," Bernard Lowe takes the elevator way down to Level B82 to check up on host anomalies that he's been noticing in the park. 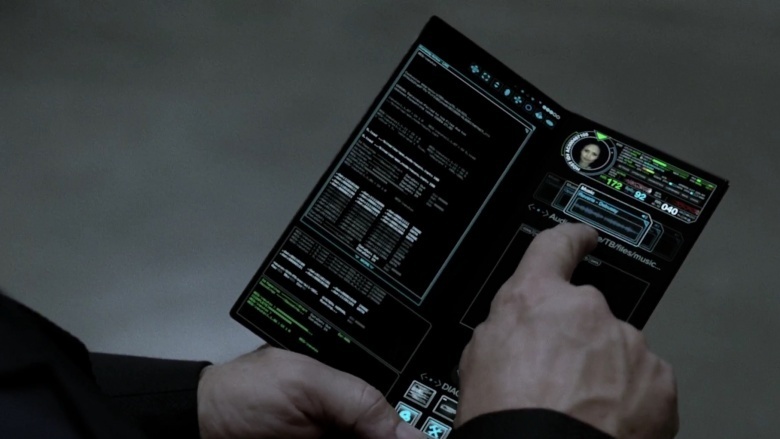 Since the anomalies are coming from first-generation hosts, he needs to use the old computer systems to track them. While he's down there, swinging his flashlight around the dark, disused sub-level, the flashlight beam falls for an instant on a shadowy cowboy pushed back up against the wall. You don't pay much attention to it — Level B82 is full of old relics from Westworld's early days as a park. A decommissioned host here and there is nothing to bat an eye at. Or is it? That old cowboy in the background is none other than an exact, pose-perfect match of Yul Brynner in character as the Gunslinger in the Westworld film from 1973. It's a nice little nod to the show's origins, although some people have already speculated that using the Gunslinger is foreshadowing the events to come. In 1973's Westworld, the Gunslinger was a robot who bucked his programming and went around killing people. But really, do we need an Easter egg to tell us that the hosts in Westworld are going to eventually kill some people? From the very first episode of Westworld, a lot of attention has been given to Ford's "reveries," his personal coding touch to make the hosts more lifelike. In particular, it's these reveries that appear to be inadvertently pushing the hosts toward sentience. Every now and then an episode will touch back on this rogue code, but Episode 8 put a whole new twist on the name. 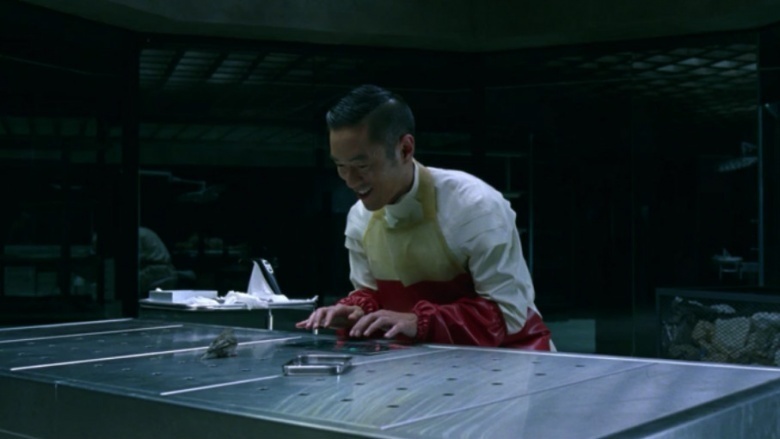 At the end of the episode, there's a flashback scene in which Maeve is brought into the Behavior labs after the Man in Black kills her daughter. When the Behavior techs can't deactivate her, they call in Ford and Bernard. Ford's response? He opens his tablet and pulls up the music folder. (Who knew they had one of those?) Then, he simply plays Claude Debussy's "Reverie," which calms Maeve down immediately. For reference, here's the song on YouTube. The shot of Ford's tablet only lasts about a second and the text is tiny, so it's easy to miss. What does it mean? On the one hand, this could simply be an Easter egg nod to a composer whom the showrunners really like (they've used other Debussy songs in past episodes). On the other hand, it could signify that Ford's code is somehow linked to the song itself within the Westworld universe. Who else wants to go back now and find all the other times "Reverie" has played in the background? Episode 8: "Trace Decay" opens on a familiar scene: a conversation between Ford and Bernard, one no different than any of the countless similar conversations we've already seen in the show. In the midst of the conversation, an emotional Bernard asks why Ford made him kill Theresa. Ford takes the opportunity to launch into a speech about "one man's life or death." It seems to imply that Theresa's death made no difference to the grand plan. Or does it? Let's hear that full quote again: "One man's life or death were but a small price to pay for the acquirement of knowledge which I sought, for the dominion I should acquire." The line is so totally Ford that you don't bat an eye when you hear it. After all, the man spouts witticisms like a fountain buried in Oscar Wilde's grave. That is, until you remember that Bernard is a host built especially by Ford as both an experiment and a tool to carry out Ford's every whim. In that light, the direct quote from Mary Shelley's Frankenstein makes a hell of a lot more sense. The scene is showing us a mad scientist speaking with his creation, who is trying to come to terms with what he really is. The nod to Shelley's Gothic classic is further cinched when Bernard lurches, monsterlike, out of his chair and roars that he'll "raze this place to the ground," a phrase that probably has no place in the future but would definitely be at home in 19th-century England. The whole conversation is basically set up like a deleted scene from Frankenstein. For those who didn't already know, the premise of Westworld comes from an old 1973 science fiction movie written and directed by novelist Michael Crichton. Plotwise, the similarities pretty much stop there, but the showrunners of Westworld haven't shied away from picking details out of the original film to use in this show. One of the similarities is that Westworld is run by a corporation called Delos, Inc. You see their logo pop up occasionally on the show, most notably when Bernard and Ashley Stubbs (Luke Hemsworth) go down to the cold storage level in Episode 1. 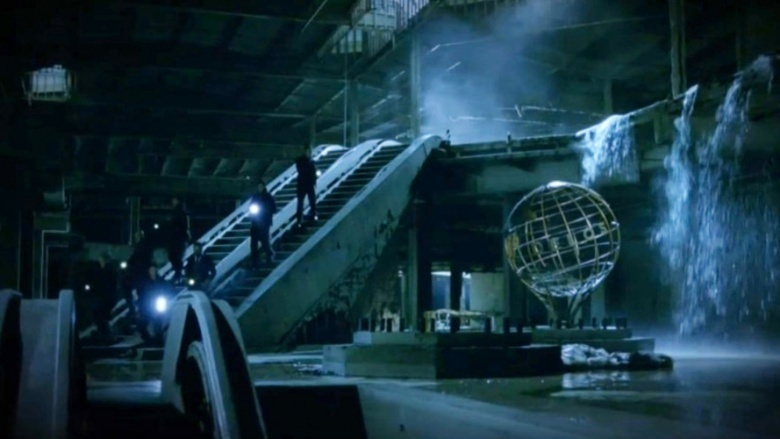 In that scene, you can see a globe with the word "Delos" featured prominently in the center. Now, the show hasn't mentioned Delos much other than simply to let us know that it exists. But that's important, because the theory behind this Easter egg is that Delos's role in the show is much more important than we realize. In the original film, Westworld is one of three parks, the others being Medieval World and Roman World. 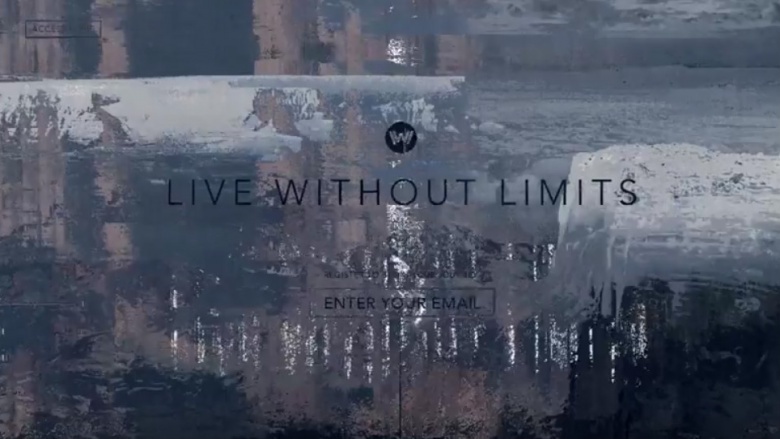 Similarly, Westworld in the show appears to be just one exotic vacation spot owned by Delos, as hinted by the official website, DiscoverWestworld.com. Designed to advertise Westworld as a real place (you can book your stay and everything), the website has one curious detail that you can find by scrolling all the way to the bottom of the home page. At the bottom, it says "A Delos Destination," which implies, well, that there are more Delos destinations. What does it mean? On one hand, maybe it's just a cool throwback to the first film, in which Delos did have more themed destinations. On another, theoretical hand, it might be a teensy tiny hint that Delos is involved in bigger things on Westworld than we're being shown. Not to say that Westworld will give us a Medieval World on the show, unfortunately. Especially since HBO has pretty much already done that. J.J. Abrams has a long history of building detailed worlds around his shows. He did it five times during Lost, and again for Fringe. So it's no surprise that several of the biggest Easter eggs in Westworld don't rest within the frames of the show itself — they're buried in the expanded Westworld universe. And one of the most important online Easter eggs is the hidden website contained in DiscoverWestworld.com. 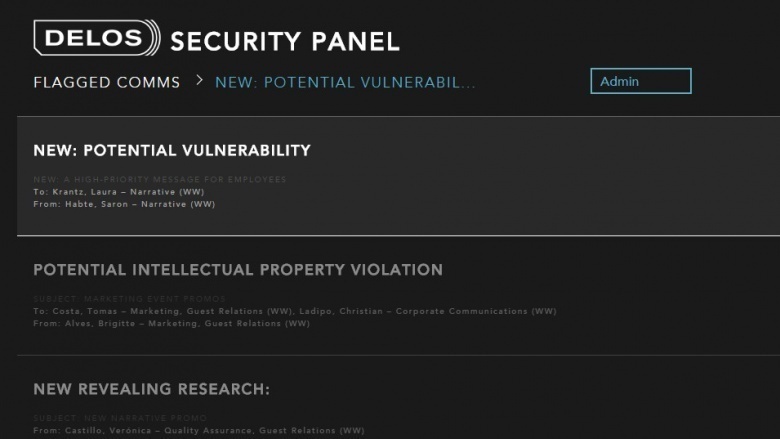 If you visit the site and type the code "VIOLENTDELIGHTS" in the "Access" box at the top of the page, you're redirected to the Delos security panel, a simulated backend server for the Delos security team. This section has Easter eggs aplenty, from humorous emails sent between staff members to "Corp Resources," which explain things like Dolores Abernathy's script loop and how the dead hosts are removed from the park to be fixed and cleaned. You can also access the hidden website by adding "delos" behind the backslash of discoverwestworld.com/ (careful, it's kind of jarring) or just going to delosincorporated.com. Just a reminder that if you're experiencing technical difficulties with your tablets and terminals, this falls under the auspices of IT, and not Behavior. Apologies if this appears obvious to most of you, understanding this distinction shouldn't be brain surgery. But you know what is brain surgery? The job of the Behavior department. Possibly the biggest question surrounding Westworld at this point is, where in the world is it? The park is obviously huge — the Man in Black (Ed Harris) admitted to visiting the park for 30 years, and he still hasn't explored the whole place. Theories range from another planet to the Moon to a completely digital space where the guests' minds are uploaded into a computer, but the DiscoverWestworld website managed to help us out here, too. Well, a little. One of the fun Easter eggs on the site is the Terms and Conditions. Like the rest of the site, it's written as if the park is a real place, with plenty of little Easter eggs to pick out if you feel like reading through the whole thing. One line that stands out, however, comes toward the end of the Terms and Conditions. It says that if a guest is found breaking any of the rules, Delos "may take any and all corrective action … including contacting local authorities on the mainland." 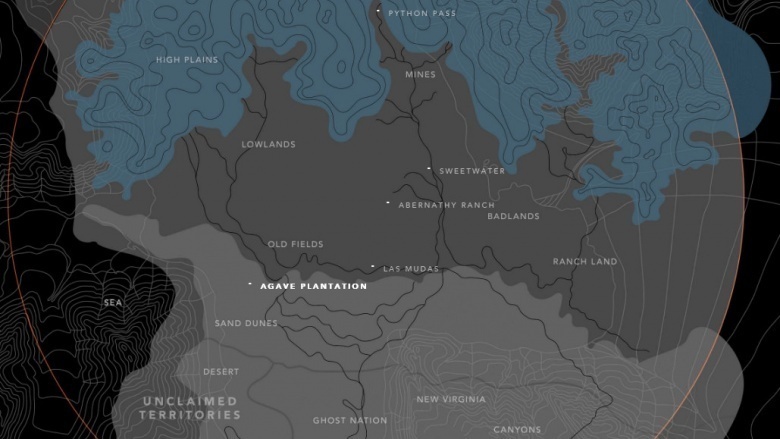 Looking at that "mainland" part, it seems likely that Westworld is on an island. There's also a note on the home page about entering the park. It says that your trip will be coordinated by the park in conjunction with "your local port authority to chart your course to the park." Is this a spot so secluded that the employees have to "rotate" out after a period of time? Sort of like that other Michael Crichton story. What was it called? Oh yeah … Jurassic Park. There's a lot to do on the DiscoverWestworld site, including (but not limited to) chatting with Aeden, the "guest services host," and trying your luck with access codes in the dialogue box at the top of the page. But God forbid you press the "Shift" key out of nowhere, because you might get more than you bargained for. The first few times results in a brief screen glitch, but if you press it too often or hold it down, the website breaks completely. It's designed to do that, of course, although it can be startling — and a little creepy — if you accidentally stumble across this in the middle of the night. Since that's when this article was written… well, you get the idea. You can do it for yourself at DiscoverWestworld.com, or you can watch the whole glitch sequence on this video. First, the screen pixelates before a reference number and ID number flash across the screen. Then, it scrolls through lines of code, glitches some more, and finally a heavily distorted video of Peter Abernathy (Louis Herthum) begins to play along with audio saying, "Hell is empty, and all the devils are here." Exactly what this Easter egg signifies is (at this point) unknown. There could be more Easter eggs hidden in the glitches, or it could just be a nutshell metaphor for the creepy and unexpected things that are still to come in the seemingly peaceful world of Westworld. Another big feature of the site is the Aeden chat bot. Meant to replicate a host AI from the park, Aeden will answer any questions you have about Westworld. Typing in any of the character names (or the cast members who play them) prompts Aeden to describe their character in the show. Then there are the sometimes hilarious Easter eggs added into Aeden's programming. For example, asking Aeden what he (it?) thinks about Game of Thrones gives the answer in the screenshot above. It doesn't stop there. You can ask about J.J. Abrams (he's a "fanboy"), Christopher Nolan or Lisa Joy (the "creative minds here at Westworld"), or Pokemon GO ("Our adventures can't be contained in a pocket"). Typing in "HBO" gives you a self-congratulatory "Westworld is the future of entertainment. Next question." And of course, typing in "Netflix" gives you the exact same response. Not particularly tongue-in-cheek. 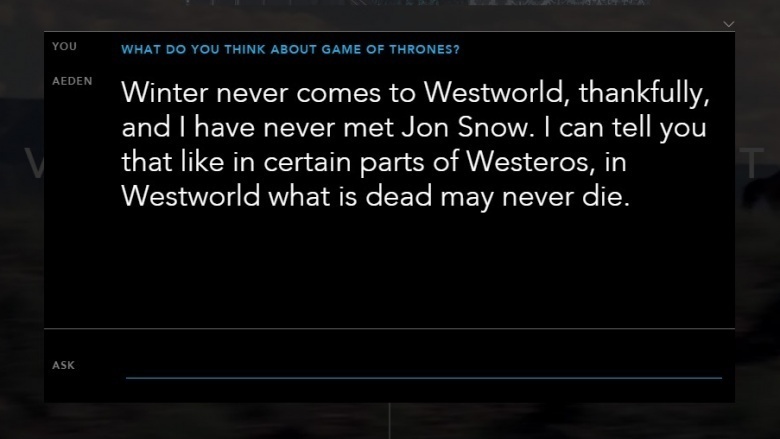 While the developers of the DiscoverWestworld site obviously had some fun with Aeden's responses, there are also some responses that hint at deeper mysteries within the show. 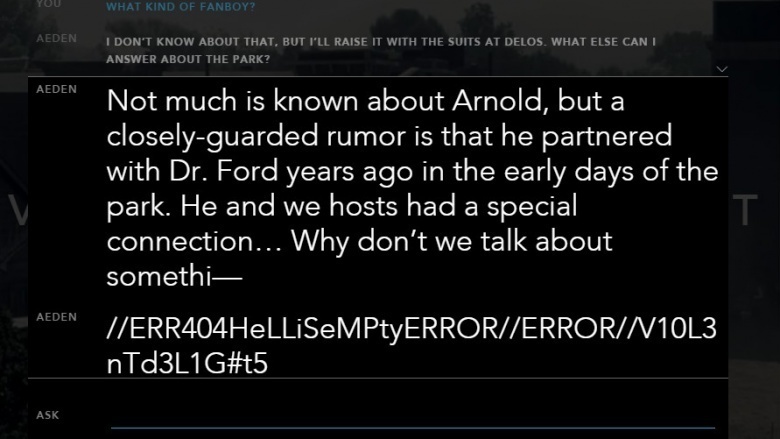 One of the names we became acquainted with in Episode 4 was Arnold, who Ford explains helped create Westworld with him. So what happens if you ask Aeden about Arnold? Aeden begins to explain who Arnold is, then breaks down into an apparent reboot, ending with the error code //ERR404HeLLiSeMPtyERROR//ERROR//V10L3nTd3L1G#t5. If you look closely, you can pick out the phrases "Hell is empty" and "Violent delights." If you then take either of those phrases and type them back to Aeden three times, you'll get a series of error messages, the last of which ends with the eerie phrase "You're in a prison of your own sins. Hell is empty, and the devils are here. Arnold will come for you." Aeden then glitches and restarts again. Cool, but what does it all mean? As always, Reddit has broken down every piece of this Easter egg, but so far they haven't come up with anything. DiscoverWestworld wouldn't be a proper Westworld website if you couldn't book a stay at the park. It's not the easiest process, but we went through with it to see what would happen. To start the process, type "whitehatblackhat" into the "Access" box at the top of the page. This opens a short video introducing the park. You can watch it, or you can skip straight to the registration. Enter your name and email, agree to the Delos terms, and click "Begin." What follows is a short but increasingly bizarre questionnaire. Finish that, and in a few minutes our good pal Aeden emails you to say that you've been accepted to stay at the park and you can now book your stay. (Aeden also recommends a role, like sheriff or bounty hunter, that might align with your personality based on your questionnaire answers.) You can only arrive on Sundays, presumably because those are the only days the train runs to the park. But this is the peculiar part: all the dates after December 4 are unavailable. Coincidentally (or not), December 4 is also the date the Season 1 finale airs on HBO. Is that a clue that something will happen in the finale that will prevent any other guests from visiting? 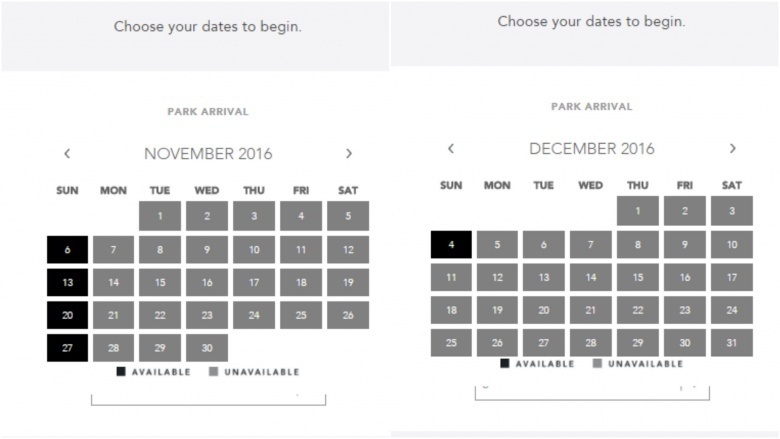 Will the park shut down after December 4 because of a — gasp — host malfunction? Or maybe it's just a red herring that ultimately means nothing. Looks like we'll just have to wait to find out. A somewhat opinionated cult has sprung up around the popular theory that Westworld is taking place over two timelines, one in the show's present era and one about 30 years in the past. Basically, the theory says that William and Logan exist in the past, immediately before the mysterious "event" that the show keeps alluding to. Meanwhile, the Man in Black, Bernard, and the main Westworld staff are living in the present. Dolores is in both, since she's a host and doesn't age. There's already been so much said about the intricacies of this theory that we're not going to go into it here, but you can cannonball into the madness anytime you want on Reddit or right here on Looper. And madness though it may be, the show just can't seem to stop dropping hints that the theory might be right after all. 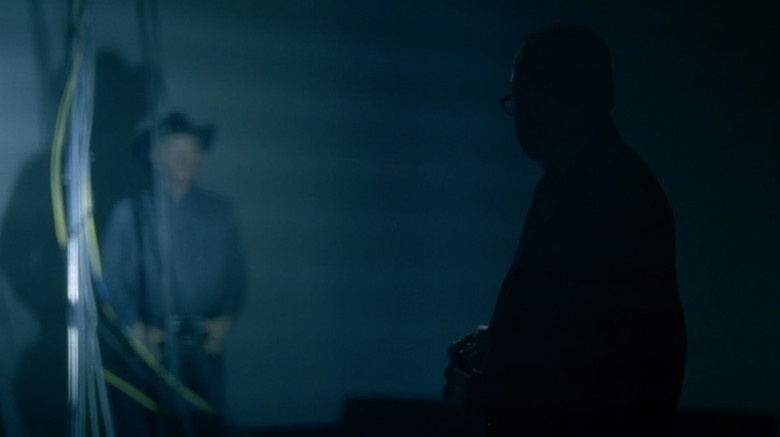 Westworld dropped another possible Easter egg hinting this in Episode 6: "The Adversary" during the same scene in which Bernard travels down to Level B82. When he logs into the computer, the Westworld logo on the screen is an older version of the main one. That makes sense — the computer is old, and it's running an old system. But it's also the same version of the logo that appears in the welcome video when Logan and William first show up to the park in Episode 2: "Chestnut." Compare it to the normal logo from the "same" welcome video that plays while Maeve is getting a tour of the upper levels (in Episode 6). Hat tip to Reddit user iheartmovies, who compiled all the scenes where the old logo shows up. Maybe the two timelines thing is an insane theory, but then again, isn't insanity a way of life in Westworld? Those are all the Westworld Easter eggs we could find, but no doubt there'll be tons more hiding in both the show and the website as the series continues. Keep your eyes open! Another Reddit spot, this one went right past most of us. In Episode 4, Dolores experiences a series of flashbacks to the mysterious church tied somehow to Robert Ford's (Anthony Hopkins) new narrative. In one of the flashbacks, we catch a glimpse of Dolores kneeling on the ground in front of a grave, digging into the dirt with her hands. If you squint, you can make out the name on the cross in front of her: Dolores Abernathy. Theories about what's happening here range all over the place, from the flashbacks being 30 years prior to the events unfolding in the show (that's a big theory in general) to glimpses of the future. On the hidden Delos website, we see that hosts killed in the park are buried in mock graves that have chutes to take their bodies down into the main labs. Maybe Dolores figures out how to get in? At the time of this writing, there are no answers.